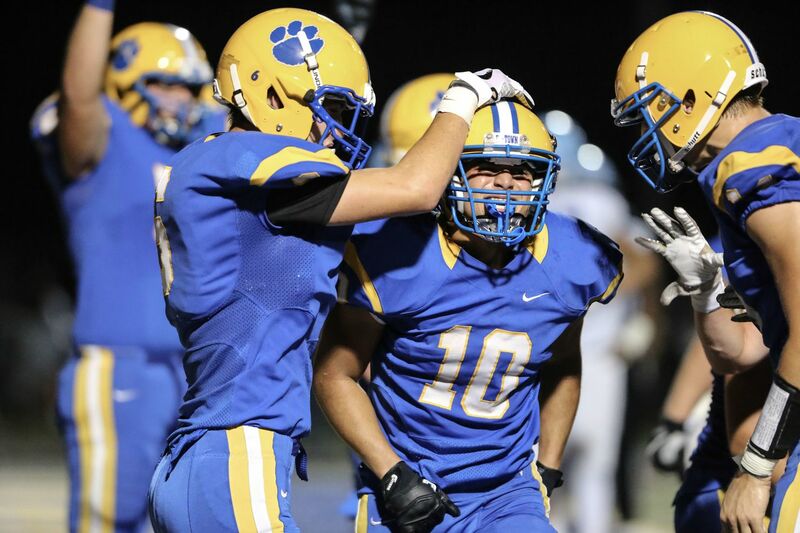 Downingtown East's Garvey Jonassaint (10) celebrates after scoring a touchdown in a 61-44 nonlague win over North Penn last season. Last year: 10-2 overall; 5-1 Ches-Mont League National Division. Downingtown East’s Stuart Regitz (43) trying to chase down Bishop Shanahan’s Andre Moffit in a Ches-Mont League National game last season. Players to watch: Garvey Jonassaint, RB: Connor Noble, TE-LB: Weston Menzie, OL; Jack Riley, WR; Stuart Regitz, LB; Luke Davis, QB; Zach Hamilton, RB, Jack O'Reilly, FB; Albert Choi, WR; Doug Brown, DL; Evan Townsend, DE; Kyle Egan, LB; James Basilii, DB; Steven Long, DB. Quick facts: As one of the team's three 1,000-yard rushers last season, Jonassaint carried 159 times for 1,051 yards and 13 touchdowns. … Davis, a 6-foot, 170-pound senior, takes over for two-year starter Bryce Lauletta (Amherst) at quarterback. … Hamilton will play lacrosse at Robert Morris; Choi will play baseball, as an outfielder, at New Jersey Institute of Technology. … Menzie (6-2, 270) is three-year starter on the offensive line. … The Cougars will open the season against nonconference foes Plymouth Whitemarsh, Perkiomen Valley (defending Pioneer Athletic Conference champion), and Roman Catholic.